Do you want to see an immediate reduction in fine lines, age spots and minor acne scars? Experience the benefits of microdermabrasion – a painless, thorough exfoliation with rapid results. A microdermabrasion treatment will reveal beautifully rejuvenated skin without any down time for recovery. Combined with a cleansing facial, your skin with be softer, smoother and brighter after just one treatment. Microdermabrasion is the process of removing the top layer of dead skin cells through the use of a gentle exfoliating tool or crystals. The exfoliating process gently lifts the dead skin and suctions it off the surface. The results reveal a new layer of healthy, smooth and glowing skin. 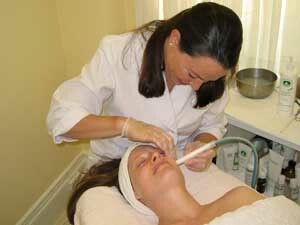 Only a professional esthetician should perform a microdermabrasion treatment. The esthetician will determine the best procedure as well as customize the pressure and speed for your skin type. I offer both the diamond tip and aluminum oxide crystal procedure. The diamond tip process uses a fine sand-like material that is best for sensitive skin. While the aluminum oxide crystal treatment is better for normal to oily skin and for someone who wants a deeper cleansing. This skin-rejuvenation procedure improves the skins appearance after just one treatment. Plus, your skin needs virtually no recovery time after microdermabrasion. You can resume your daily activities immediately afterwards without worrying about redness or puffiness. Of course, sun screen is highly encouraged to protect your new skin cells. I suggest combining microdermabrasion with a deep pore cleansing facial. Microdermabrasion will remove the surface skin and help unclog pores, but combined with a deep cleaning facial, your skin will be purified, refreshed and hydrated. This facial includes a thorough stream, extractions as needed, and then a deep penetrating hydrating mask. To see the lasting effects of microdermabrasion, it’s recommended to receive a series of treatments every 2 to 4 weeks. The skin appearance improves with each treatment. Each time your skin regenerates, the blemishes and irregularities will be further and further reduced.